The content for this article was contributed by Alec Mercier of Tecsult Inc.
On a recent project, Tecsult’s HVAC (heating, air-conditioning and ventilation) system engineers had to consider two different configurations of a powerhouse’s air-conditioning system and were interested in demonstrating which one would provide the greatest level of comfort for the workers at the floor level. FLOW-3D was used to simulate and compare the alternative designs. The powerhouse is a large (90m long, 33m wide and 26m high), open-area building containing heat-generating equipment such as transformers, power bars, and lighting. The purpose of the air-conditioning system is to limit the maximum temperature in the building to 35ºC. Since the diffusers are located at the lower levels and the vents near the ceiling, the maximum air temperature occurs near the ceiling and the floor level is necessarily a few degrees cooler. The simulations provided a detailed comparison of temperatures and flow patterns throughout the powerhouse for both alternatives, and supplied Tecsult’s HVAC system engineers with valuable data to support their design choice. As part of the detailed design of the powerhouse, the engineering team proposed two different configurations of the air-conditioning system, and determined the number, size, and distribution of diffusers and vents, along with their respective flow rates, inlet/exit air velocities, and angle of projection. In both configurations, the system is comprised of three ducts blowing cool air into the powerhouse at a temperature of 25ºC and three return vents located near the ceiling. The difference between the two alternatives lies in the position of one of the air ducts. In the first alternative, the air duct runs along the upstream wall, 5.6m above the floor. In the second alternative, the air duct runs along the downstream wall, 11.1m above the floor. Figure 1 shows the powerhouse and the layout of the air ducts corresponding to alternative 1. Figure 1. 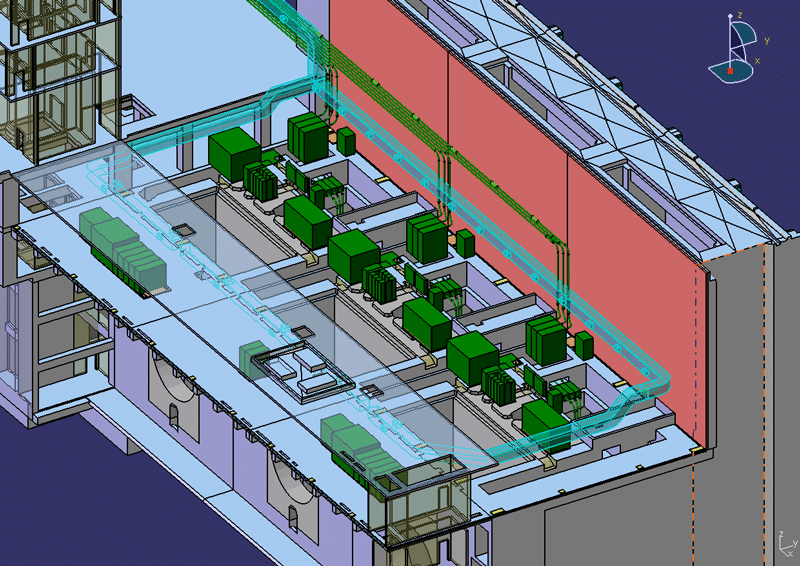 Alternative 1: General view of the inside of the powerhouse, heat-generating equipment (green), and ducts (light blue). The most important phenomena that govern flow patterns in this type of problem are the convection currents induced by heat-generating equipment, which are usually located on the floor, and the variation in air density with temperature, i.e., buoyancy. The system engineers utilized the mass/momentum sources feature in FLOW-3D, which allows air to flow into a defined area with a specified velocity and direction. Mass/momentum sources are especially useful for simulating HVAC systems with diffusers and vents since they are often numerous and located away from the edges of the computational domain. This makes their specification difficult in a structured mesh. Mass/momentum sources can be placed arbitrarily in the domain without consideration of the proximity to mesh boundaries. The simulations provided a detailed comparison of temperatures and flow patterns throughout the powerhouse for both alternatives, and supplied Tecsult’s HVAC system engineers with valuable data to support their design choice. 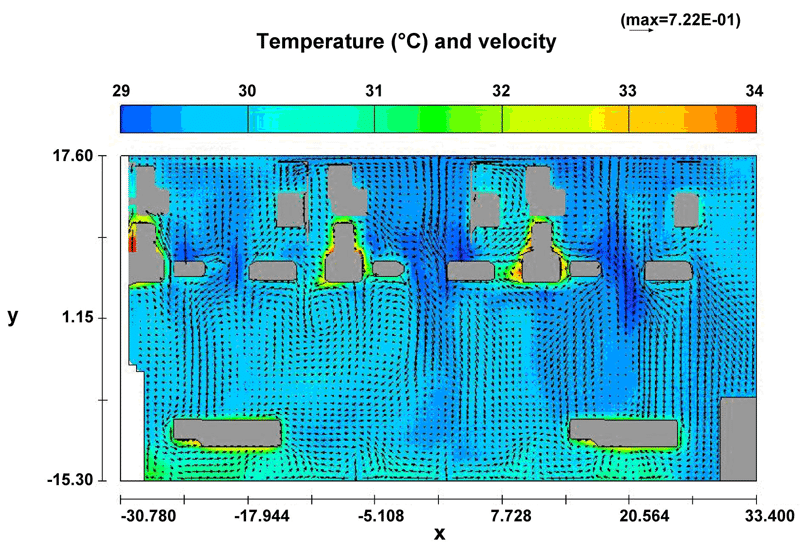 Figure 2 shows the temperature distribution in a plan view of the powerhouse, approximately 1m above the floor. Temperatures shown are generally between 29 and 30.5ºC, with locally higher values around heat-generating equipment. The maximum temperature is around 34ºC on the left wall.